introduction by Jeff Smith <<•>> The first NEW Beanworld book in... well, we're not sure how long, but we know the number of years is in the double digits, so all you long-time Beanworlders have a real reson to celebrate, and all you Johnny-come-latelies, well, you know, you have a reason to celebrate too, even if you don't know it. Beanworld was one of the few true originals of the "Black and White Explosion" titles that flooded the market during the mid- to late-80s. 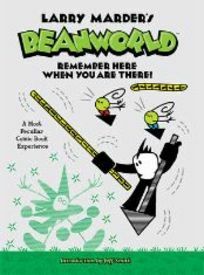 When the flood ebbed, it took most of the forgettable titles with it, but Beanworld had established a firm beachhead on the comics terrain, with a strong core group of supporters that have kept it alive – if out of print – for the intervening years until its 2009 return, courtesy of Dark Horse Books, which began with the collecting of all extant work in two hardcover books, and has now culminated in this third, all-new volume, the first made-to-order Beanworld graphic novel. Get beany at Larry Marder's Beanworld Bog.